Anchor: Samsung Electronics unveiled its latest Galaxy Note 9 phablet in New York on Thursday. The South Korean tech giant's newest premium device is equipped with a Bluetooth-powered stylus and the best battery and storage among its models. "It is my great pleasure to present the all new Galaxy Note 9." 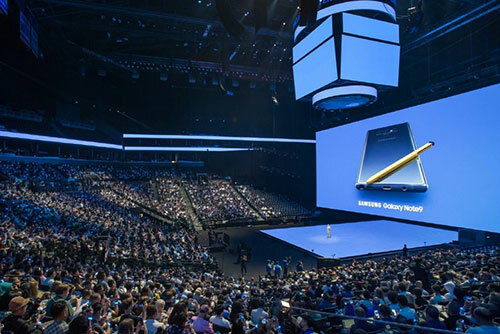 Samsung Electronics' new product, the Galaxy Note 9, which showcased in New York Thursday, features a six-point-four-inch display with a Bluetooth-powered stylus "S Pen" that also serves as a remote control. The improved stylus allows users to control apps and snap selfies from up to nine meters away with just a click of the pen. "So now you can use your S Pen for even more tasks like opening applications, acting like a remote shutter, so I can use it to take a picture, and I can use it to even do things like control my music." Another distinctive feature of the Note 9 is a much bigger battery compared to its predecessor the Note 8. It will allow for more than a day of normal use without recharging. Samsung, which has been cautious about expanding battery capacity following the fiasco over its Note 7 batteries catching fire two years ago, has responded to market demand after conducting multiple inspections of its phones. "The brand new Note 9 has a four-thousand-milliamp hour power battery, which is the largest battery we've ever put in a Note." The Note 9 also boasts bigger storage at 128 and 512 gigabytes, a high-performance processor capable of download speeds of up to one-point-two gigabits per second, and a new cooling system for a longer maximum performance. As for its camera function, the phablet can optimize settings depending on objects and inform the user if a person's eyes are closed or if the photo is out of focus. Sale of the Note 9 will start in South Korea on August 24th, with preorders starting Monday. The price tag of the 128 gigabyte model is expected to be around one-point-09 million won, while the 512 gigabyte edition will cost around one-point-35 million won.